Bringing safety to your business and homes. Scandic Coating Sweden is a company that specializes in anti-slip solutions and is the Scandinavian antiSLIPsystem® agent for FSI International BV, Capelle aan de IJssel (near Rotterdam) in Holland. FSI International BV has its agents in Africa, Asia, America, Uruguay, Chile and Australia. New Zealand, United Kingdom, Russia, Slovenia, Baltic States, Bulgaria, Hungary, Germany, France, Spain, Italy, Belgium, Greece and Cyprus. Our purpose is to reduce the number of Slip & Falls accidents in Scandinavia caused by slippery floors. The extent of Slip and Fall accidents are enormous in the Nordic countries and not just because of snow and ice. In Sweden alone, the cost is about 6 billion as a result of these accidents, and half may be related to slippery floors. Our aim is to tackle all kinds of existing slip hazards, in an early stage, before the accident occurred. Unfortunately, many customers contact us AFTER the accident has already happened. To reduce accidents, we must work preventively if we want to create a safer everyday life for both the young and the elderly. Do you want to be one of the Scandic Coating Sweden Certified Partner? 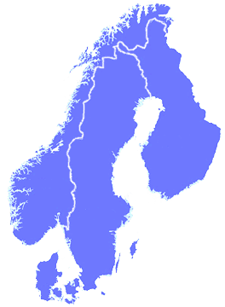 We are looking for more partners who can carry out operations throughout Sweden, Norway, Finland and Denmark. If you are accurate and service minded and likes to help others, please contact us for more information.